The PEN Team is thrilled to announce that our 200th Knowledge Pathway - Outcomes of Dietitian Interventions is now published! Check it out here. Do you ever read a Practice Question in PEN and wonder: What was the time period of the literature search? or Where did the author find the evidence? or Why wasn’t that article included? what is the time frame for the search. This information has always been a valuable part of our internal files. Going forward, the PEN Team is adding Search Strategies to the PEN website for new and updated Practice Questions so that PEN users can avail of them. You can see the Search Strategy underneath some Practice Question titles now, as in this example: Should omega-3 fatty acids (fish or plant-based food or supplements) be recommended for primary or secondary prevention of cardiovascular disease (CVD)? We hope you find this new resource helpful in your evidence-based work. Check out our PEN Year in Review Infographic for an overview of the 2017 highlights. 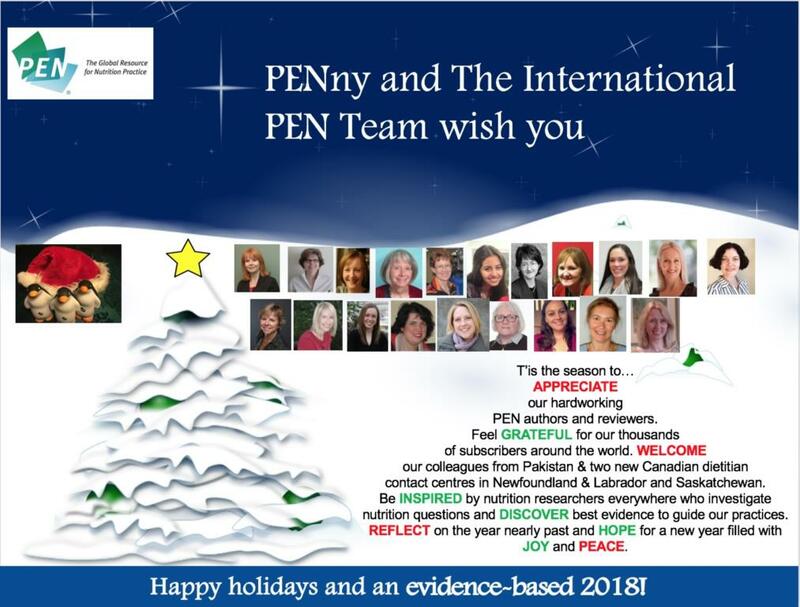 Holiday Greetings from the International PEN Team! Click on the survey box and you will see just one question to answer. Thank you for sharing your thoughts! The PEN Team is asking for user feedback on a number of PEN Toolkits and Background documents. Once you click on certain Toolkit and Background titles you will be asked to complete a very short survey. The survey opens in a new window so you can continue to look at the content and then complete the survey. Please say Yes to the Survey! New PEN Video Tutorials Available! These tutorials are available in English, with subtitles available in French. Subtitles in Spanish and Japanese are coming soon. Check out the tutorials and learn tips to enhance your PEN experience. First GRADE Practice Question Posted! The PEN® Team is excited to provide an update on the use of GRADE in the PEN System. The first GRADE Practice Question was published on November 23, 2016 - Is a reduced saturated fat diet recommended for primary or secondary cardiovascular disease (CVD) prevention? There are a number of GRADE Practice Questions in development; some of which will be published in the very near future. Check for updates on new and updated content in the New Knowledge Pathway Content section on the PEN home page. PEN navigation now available in French! Members of the PEN Team were at the International Congress of Dietetics (ICD) in Spain. In addition to meeting and dialoguing with delegates at the PEN booth, team members were also conference presenters and even won an award! Check out the key highlights from Spain's ICD here. Thank you, Merci, Arigatou, Gracias to our Volunteers! PEN would not be the growing international database it is without the valuable support and input from our amazing volunteers. See who participated the past three months: PEN eNews 5(6) April 2016. The new look of our PEN® website! You will enjoy the same quality of evidence reviews, Trending Topics, client handouts and professional resources - but through a new and enhanced design! And it’s responsive, meaning it will flex to accommodate different screen sizes so you can use PEN on your phone or tablet device. Please use the New PEN Website Feedback button to provide your feedback. We are pleased to announce the PEN System was recertified with the Health-On-the-Net (HON) group.